There was an awkward moment when President Donald Trump and first lady Melania Trump were seated in the front pew. 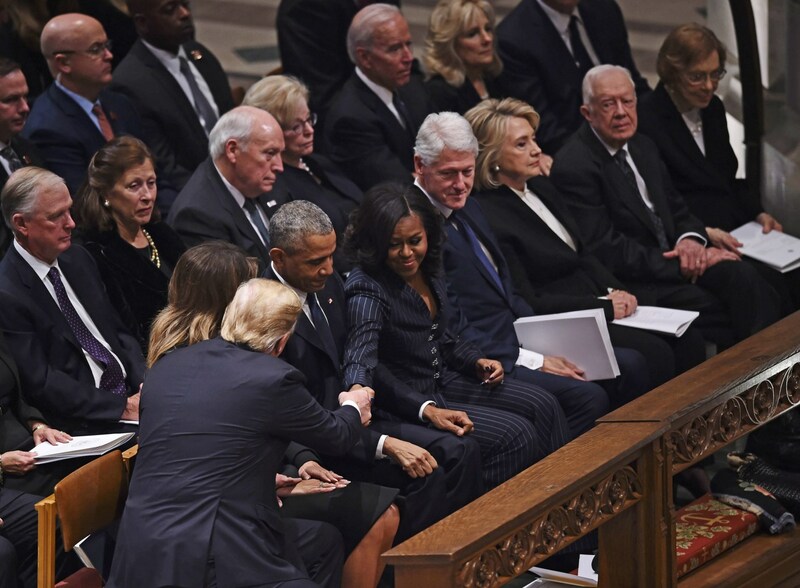 Former President Barack Obama reached out to shake Trump's hand, and former President Bill Clinton looked across the Obamas as if he wanted to make some sort of connection with Trump. But Hillary Clinton, who lost to Trump in the 2016 presidential election, gave no sign of acknowledging Trump. Instead, she nodded to Melania Trump, who waved to her and former President Jimmy Carter. The Obama-Trump handshake appears to be their first direct interaction since Trump's inauguration nearly two years ago.